of E.I. du Pont de Nemours and Company". ONCE THESE ARE GONE THAT'S IT. WE CAN ALTER THE LONGER LENGTHS IF YOU FIND YOUR WAIST SIZE IN STOCK! Well, most Experienced Riders will tell you, "It's not "if" you go down, it's "when", so why risk it? 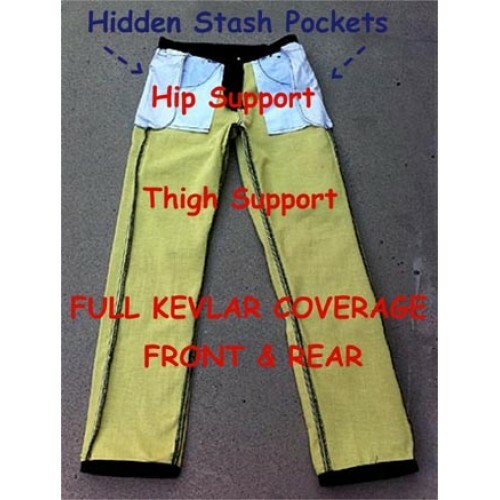 Protect your legs, hips and knees, with our Kevlar ® Inhanced Riding Jeans , they cover you where it counts, yet they are so comfortable you may forget you're wearing Abrasion Protection. That's because our Jeans have Flexible Woven DuPont™, Kevlar® in the Seat, Hips, and Knees ALL the Way Down the Front and Back for Full Coverage Protection! Warm in the Winter and Comportable in the Spring and Fall! But I wouldn't be caught without them on when I ride! or Camp, or Hike, or Quad riding, Horseback riding... It's your Second Skin, Save Thousands of Dollars in Co-Pay's and Deductibles IF YOU do go down! That's how I got into the DuPont™, Kevlar® Riding Jean business, when I went down I was going around 35mph, but the curve in the canyon came too quick as I rose over the hill and couldn't slow it down enough to make that turn, so laying it down on the cheap side, (Pipe side is EXPENSIVE!$!) I quickly saw how much a minor accident would cost me in Dollars and Time Healing! Just Makes Sense, you put on your Boots, Jacket, Gloves and Glasses, some of you Helmets too, and HALF of your Body is Exposed to the Road EVERY Time you Ride. Sure you can Leathers, and if you don't have a Sport Bike, then you look silly, no one wears leather pants... yeah there out there, cool. Chaps, where do you put them when you get hot or need to take them off. Great for Riding and going out to Dinner that Night, no one will know your wearing DuPont™, Kevlar® Protection ! Similar to the LEVI 501 "Cut" for that Comfortable Fit and Style that you Know and Love! Also they have Two Hidden "Pouches" for the (optionable, you can use them or not) "Hip Protectors" that are included, or you can stash Money or Registration etc. in the Pouches instead! Our "Black/Blue" Denim Riding Jean is also a Heavy-Weight Pre-Washed Blue Denim with a 200 weight DuPont™, Kevlar® that is Dyed Black Several times to get this "Black/Blue" Jean affect . Over time the washing of our "B/B" Riding Jeans will fade to a Softer Black with Blue Showing through eventually, for a Hi Fashion look that is Popular Now with the Faded Designer Jeans! Both colors have 5 belt loops up to 32W; 7 belt loops to 42W. Much better than our Competition, they use "patch work" sewn style jeans that look like Painter's pants, and have NO Protection on the Most Part of your Body! 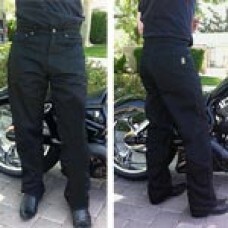 "Best Fitting Riding Jeans I've Ever Had! Lots of Crotch room and I even wear them on Cold days when I don't Ride! "D. Jackson"
Sizing: Take a favorite pair of your jeans that fits you just right, and lay it out flat as shown. To get the correct waist size, take the measurement and then multiply that number by two. 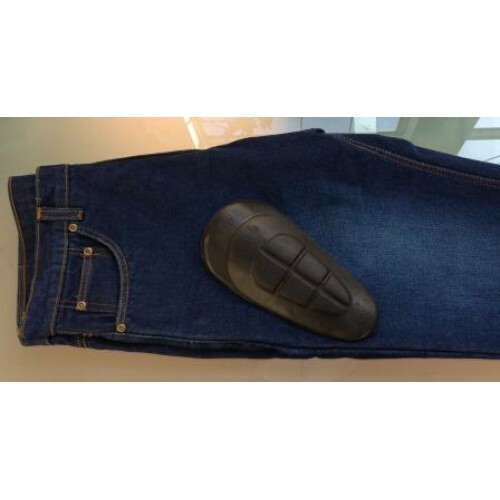 In the example shown, the jeans measured 18 inches across. This results in a waist size of 36. When measuring your length, take the tape measure and hold it on the Inseam and measure down to the end of the leg. It's better to be an inch longer so they don't ride up too high when your sitting on your bike! You might want to check when you sit on your bike if your jeans are long enough, as it's better to be a little bit longer than short. They can always be hemed. If you require a size that's not listed on the order page, order the next larger, and you should be comfortable. If your concerned about the Size just order ONE SIZE LARGER to be Comfortable. If you don't see your size, you can go up a size for comfort, you can get a length longer as they can be hemmed shorter. Our Jeans are Pre-Washed! But like ANY Jeans they shrink a little and stretch a little as well! Follow these instructions, as we Don't Pay for Return Shipping because of your inability to Measure Properly. Here checkout our competition, see the UGLY Styles they sell! Same Price or Higher as ours with "Patchwork" Kevlar and Ugly seams! Ours are "Fully Lined" no Patchwork Seams! Choose from Dark Blue or Black Denim. International Priority Shipping is about $58.00 depending on the destination. Overcharges will be Refunded after shipping and we know what it is! 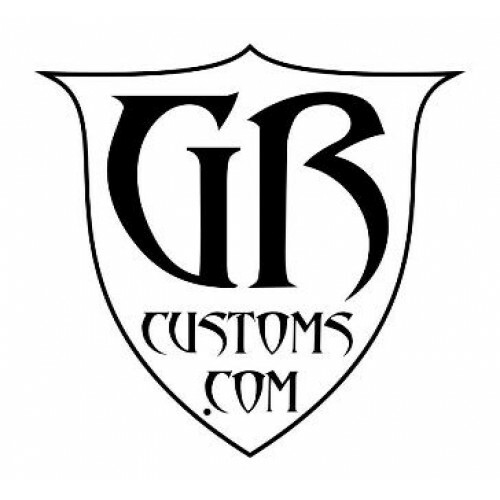 Product Code: GR Customs "Riding Jeans"